I recently bought a 4K monitor (LG – 27″ IPS LED 4K UHD FreeSync Monitor model 27UD68) with 4x the HD (1K High Definition 1920×1080) resolution or 3840×2160 resolution. Upon its arrival, I was so excited to set it up and hook it up to my computer, which I already checked before ordering that its embedded graphic controller can support 3840×2160 resolution based on the Intel CPU Description by searching for the CPU’s “ark.” For example, my computer has an Intel i5-4590 CPU. I googled and saw my CPU can support 3840×2160 resolution based on Intel’s ARK here, it should support 3840×2160 without any problem. After plugging the DisplayPort to HDMI cable that connected the DisplayPort to the computer and HDMI port to the monitor, I saw the wonderful 4K display. Everything looked smaller but with a high resolution, just like Apple’s Retina Display. The only problem was that my computer appeared to be not very responsive to my mouse and scrolling actions. It’s very annoying. I almost wanted to switch back to my original HD 1K monitor. Then I looked closely at the graphic display, I saw that the display was only running 29 Hz refresh rate. I tried to force the refresh rate 60 Hz but it wouldn’t let me, complaining that it exceeded the maximum bandwidth for the port. After examining the spec closely, the HDMI port supports only HDMI 1.4, which according to Wiki page, can support up to 30 Hz at 3840×2160. In other words, the refresh rate limitation is on the HDMI protocol, not the CPU nor the system. 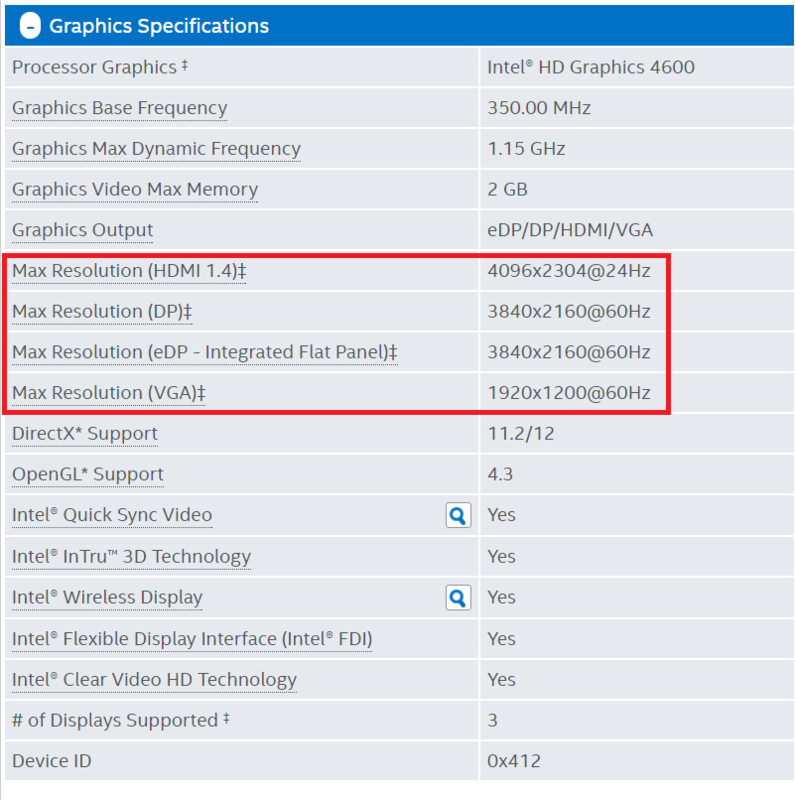 Then I checked again and saw the DisplayPort can support up to 3840×2160 @60Hz. I immediately changed the cable from DisplayPort to DisplayPort. The computer immediately register 59 Hz automatically. Wow! It made a huge difference on how I perceived the responsiveness of the display. It’s like day and night. 1. The display refresh rate has a lot to do with how you perceive the responsiveness of your computer. 2. Always check if your computer or laptop can support the display mode your new monitor is capable of running. Check with the CPU spec by googling the specific CPU model name. 3. Don’t count on the HDMI port to support 4K monitor at 60 Hz unless it’s capable of HDMI 2.0. Use DisplayPort to get the maximum resolution at a high refresh rate.